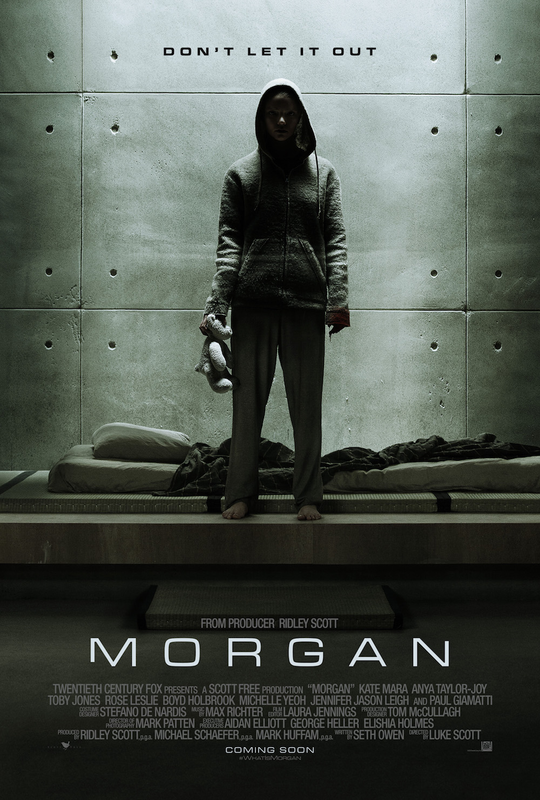 My husband and I went to see Morgan today, a movie directed by Luke Scott and produced by Ridley Scott, we sort of knew what we were in for, the Scott name clued us in to expect sci-fi which we love. This movie was so good, it made us think, it kept us on our toes, I was thinking about what prejudice, scientific research, experiments, humanity, emotional intelligence, intelligence and corporate responsibility meant in the grand scheme of things. I don’t want to give anything away, but suffice it to say that the plot is tight, there aren’t any lulls in the storytelling, it takes you down the rabbit hole and brings you to the other side quickly. The acting was great, I’m a big fan of Kate Mara’s, she put in a heck of a performance. I’m not sure if this movie is going to be a hit, but I highly recommend it, it kept me out of my head for almost two hours and took me on a journey where I couldn’t see the ending until the last possible second when it was presented to me right before the screen went dark.